The authors present the complete guide to ANSI standard C language programming. Written by the developers of C, this new version helps readers keep up with the finalized ANSI standard for C while showing how to take advantage of C's rich set of operators, economy of expression, improved control flow, and data structures. The 2/E has been completely rewritten with additional examples and problem sets to clarify the implementation of difficult language constructs. 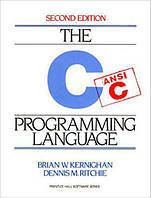 For years, C programmers have let K&R guide them to building well-structured and efficient programs. Now this same help is available to those working with ANSI compilers. Includes detailed coverage of the C language plus the official C language reference manual for at-a-glance help with syntax notation, declarations, ANSI changes, scope rules, and the list goes on and on.